So what does one do with all the scraps and left over pieces of cedar from bigger projects? Well I have found many fun things to make out of those off-cuts. 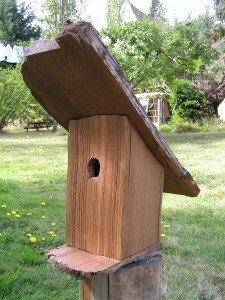 I make picture frames, boxes, and birdhouses! 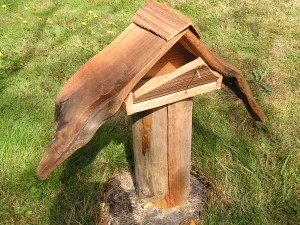 Even the birds sometimes like to live in fun and funky little handmade houses. While splitting cedar for projects like fencing or garden structures I create a lot of waste, which when cut into smaller sizes can be used for small scale projects. The rest of the cedar that is not usable for woodworking is burned as kindling. Once a year I have a big kindling/firewood sale ($50 a pickup truck load) and get rid of anything I cannot use. I save up those curved and unique little pieces in my workshop and use them to build birdhouses for fun or by request for clients. When I hand split the red cedar it follows the grain, so if the grain curves around a knot, so will the split piece, and sometimes I just leave the knot as a nice feature. Birdhouses can be any shape or size, but it can be important to know what kind of bird you might be building the home for. 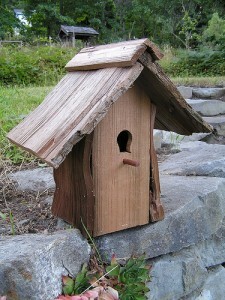 The type of bird can determine the size of the house, and more specifically the size of the entry hole. For some common examples of birds you might have in your neighbourhood and the specific sizes for them please see the chart below as a guideline. ﻿﻿Sometimes you might have wood of a certain size, so I just make what I can out of that, and make the entry hole the appropriate size for local birds. Here on Pender Island, BC, I often keep the hole smaller than a sparrow can fit in, that way they do not come in and take over the nest of other birds as they will often do. There are no real rules to building birdhouses so I just have fun with it, and try to come up with fun and creative designs. One other thing that I do always include that is important is a back door that opens (usually I use a screw to keep it closed) so that you can periodically clean out the nest box. It is also a good idea to have the roof overhang the entry hole a bit to provide some rain protection. 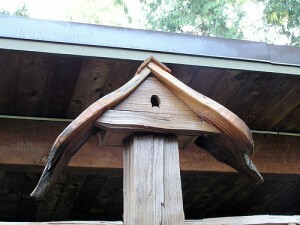 One thing I have learned since I started making birdhouses is that you do not need to include a perch below the hole. Small birds do not need this, and it can actually attract predators and give them an easy perch. The natural red cedar is a great wood to build birdhouses with. I don’t use any stains or paint, and do not recommend building birdhouses out of plywood or other wood products made with glues. The most fun is watching the birds use their new home with my kids!